This just in: New Poet Laureate! SANTA CLARA COUNTY, CALIF.—Today, the County of Santa Clara Board of Supervisors appointed David Perez to the honorary post of Santa Clara County Poet Laureate for a two year term (January 14, 2014 – December 21, 2015). Perez was recommended to the Board following the call for applications, and a two step review process organized by the County and Silicon Valley Creates. Perez is a poet, writer and educator. He is a professor of English at Ohlone College and has toured throughout the United States and Canada to give readings and book signings. He is the author of Love in a Time of Robot Apocalypse under Write Bloody Publishing, and his poem Surgir appears on the San Jose Mexican Heritage Plaza Founder’s Plaque. In July 2012, Perez was voted “Best Author in the Bay Area” in the San Francisco Bay Guardian’s annual readers’ poll. He also received the Arts Council Silicon Valley Fellowship for Literary Art in April 2011 for his contribution to empowering Silicon Valley communities through the arts. Perez will take the two-year post in January 2014. He is the third poet laureate to be appointed by the County of Santa Clara. Nils Peterson was the County’s first Poet Laureate (2009-2011), and Sally Ashton served as the second Poet Laureate of Santa Clara County (2011-2013). Perez holds a Master of Arts degree in Creative Writing from Goddard College and a Bachelor of Arts degree in Literature from University of California, Santa Cruz. 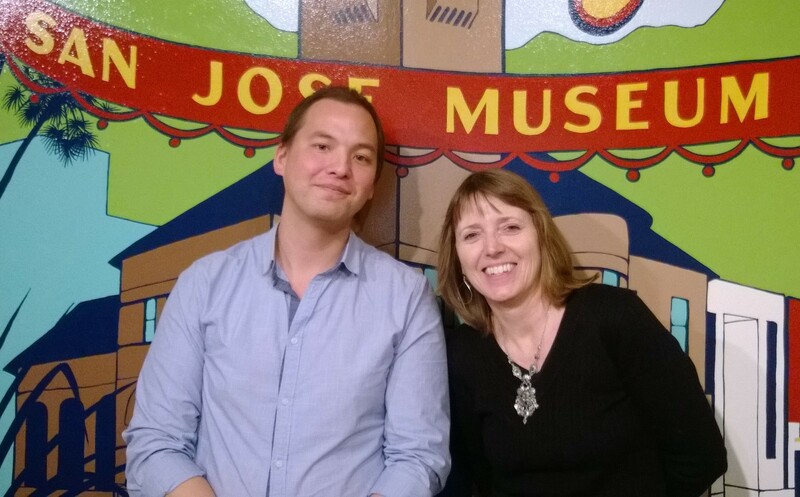 And . . .Here I am with the new “PL” at the San Jose Museum of Art where he’ll be hosting this year’s Poetry Invitational on April 17th. Don’t miss it. This reading of poems based on current museum exhibits was launched by first Poet Laureate, Nils Peterson. It’s a fabulous tradition and is sure to be again this year. I’ll be making one last post here before handing off the blog to David so stay tuned, tell your friends, and follow that blog! Totally wicked! I can’t wait to meet him/you. (Hi David/Sally!) Congratulations and may your reign (term) be full of wonder for the county and her inhabitants. Welcome. The news is finally out! David Perez will be the third Poet Laureate in Santa Clara County. Welcome David! Fantastic! Can’t wait to meet David! He has some pretty big shoes to fill. Congratulations, David Perez! Finally, the cat is out of the bag. Welcome to a whole new year of poetry for Santa Clara County. I look forward to your poetry and new ideas to celebrate our County.There’s a whole poetry community out here. You have our support. Good luck in your endeavors.